If anyone doubts the existence of good Karma in the universe, they only need meet Minnie and Brian to have their minds changed. Tell people that you are going to Sprague Farm & Brew Works and the response from anyone who has spent any time there is universal. "Brian and Minnie are the best people ever," gushes Joel Hunter, as Brian Sprague walks over to the bar to get him another draft. Joel is just one of many people who have fallen under the spell of hospitality that Brian and Minnie Sprague cast. Right now Joel is sitting outside under a canopy, pulling the stems off fresh-picked cascade hops on a bright Sunday morning. He throws a handful into his beer and takes a sip. The beer is the Hunter High-P-A, which was brewed in his honor and is one of over 30 different beers crafted here over the last decade. 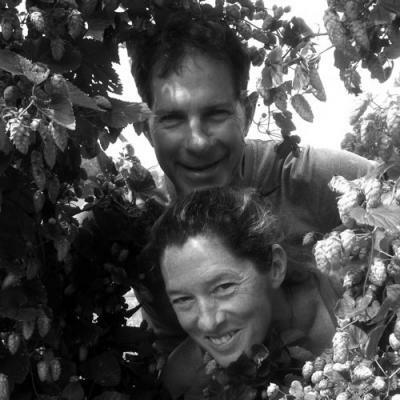 Four years ago, the Spragues contacted the Penn State Ag Extension office to find an agronomist to help them turn some of their 65-acres into a working farm that would enable them to grow their own hops and barley. Joel got them started and became so smitten with the people and the place that he hardly ever leaves. Most of the work he does around the farm is on his own time. He gets paid in beer and camaraderie. And there has been plenty of work around the farm, brewpub, and brewery to do. When the Spragues bought the gigantic barn, corncrib, and farmhouse just west of Cambridge Springs, the property was pretty worn out. Converting the barn into an office, brewery, home, and beer hall was work enough, but as any new business venture needs money, the Spragues also turned the farmhouse into a rental cottage. Friends and family have spent days at a time helping their favorite people sand and saw and shore-up and paint. Convincing people to help them out has never been a problem for Brian and Minnie. When you give as much as they do, people are more than happy to give back. Just one of many anecdotes in the life of the Spragues that show that the love you take is equal to the love you make. On a dog-day summer afternoon, Minnie spotted a homeless drifter sleeping under a tree near their property. She asked him if he would like a place to stay the night and get a shower. The guy was so grateful that he spent three of the hottest days of the year hauling old trash out of the farmhouse attic. He doesn't need a place to stay any more but visits the farm often these days to spend time with this couple who were so kind to him. If anyone doubts the existence of good Karma in the universe, they only need meet Minnie and Brian to have their minds changed. And it was probably Karma that pulled Brian and Minnie toward each other in high school. They were sweethearts at General McLane in the late '70s and have been partners in life and business ever since. College wasn't physical enough for Brian, so he left school to work as a mason. He still has a full time job for the oil and gas industry when he's not helping Minnie run the business. The health insurance alone makes it worth the effort, since money is always tight. Minnie quit her job in 2006 to run everything at the brewery which is enough to keep her hopping 24/7. "Minnie has the business mind," says Brian. Minnie responds that, "Brian gives stuff away all the time." They estimate that before they opened the beer hall, "Bierhalla" as it is named, they gave away tens of thousands of dollars worth of product in their taproom. Between that generous distribution of beer and oppressive Pennsylvania state liquor laws, it was tough to make a living as an independent brewer unless they served food and ran a brewpub, so they decided to finish the barn. Bierhalla is an enormous hay loft with a vault ceiling and a heterogeneous mix of miss-matched tables, a lovely bar area, and a stage where Roger Montgomery and Jake Banta regularly play. The sturdiest "Jake-Proof" tables sit in front of the stage in case the great blues guitarist decides to solo on top of one. If customers want to sit and talk, they can get away from the noise in a small lounge "VIP" area. Outside is a deck adorned with comfortable chairs and hop vines. Nearby is a newly built pavilion, complete with its own stage and bar which can be rented out for wedding receptions and other gatherings. The kitchen is small, underplayed by the Spragues' business model, which concentrates on good beer, good music, and good times. When the brewpub first opened, the PLCB told Minnie that they had to have enough food to feed 30 customers and peanuts didn't count. So she sent Brian out to buy 30 hot dogs and buns. That was good enough for the inspectors, and for the first couple months, they kept packages of hotdogs and cubed cheese in the fridge until they could find the resources to enlarge the menu, which is still limited, but much tastier. Customers' only suggestion for improvement at Sprague Farm has been more food choices. Ever eager to make other people happy, Brian is now building an outdoor pizza oven with the help of one of their neighbors, a potter who will be covering the entire thing with original ceramic tiles. But you won't just find art on a stone pizza oven. Any visit with the Spragues reveals their love of art and the artistic. They decorate with paintings by their friends Jan Lutz, Mark Weber, and Lee Steadman, whose son Luke is employed as the Sprague Farms brewmaster. The bar in the pavilion is made from a mast from the old Brig Niagara. Doors, windows, stained glass, and giant tin beer signs have been cobbled together from back rooms, old churches, and Construction Junction in Pittsburgh, where everything for sale has been salvaged from demolition sites. The eclectic decor is not limited to work by other artists, as the entire site is full of chainsaw carvings made by Brian. Full-sized wooden Indians and lions show up in unexpected places, gazing at guests with wooden eyes that are bright and hungry. The sculptures look as if they would happily sneak your beer away from you if only they were animated. Where Brian finds the time to be such a prolific and talented artist is a mystery, since he works a full-time job and essentially throws three gigantic parties every weekend. Brian and Minnie have also managed in the last few years to build a picnic shelter and the aforementioned pavilion, converted an old fire truck into a mobile tap system, and hosted the Crawford County Music Festival in their back field. Even though it rained buckets that weekend this past summer, a good time was still had by all, due in no small part to the efforts of Brian and Minnie, who worked their tails off so WQLN's fundraiser could be successful. Now it's two months and a couple dozen parties after that joy-filled weekend, and as this Sunday morning turns into afternoon, three self-proclaimed beer geeks wander up to the canopy where the pile of hops is being vacuum-sealed by Brian, Minnie, and Joel. The beer geeks are part of the group from Pittsburgh that has been staying at the farmhouse since Friday – a great option for people who come from out of town to enjoy a weekend of beer and music. "What a great place," one of them says. "You have been the most wonderful hosts. None of us can wait to come back here again." And just like everyone else whose lives are touched by the Spragues, they leave completely enchanted by their new friends and excited to spread the good Karma they felt while they were here at the Sprague Farm & Brew Works, where the Winston Churchill quote – We make a living by what we get. We make a life by what we give – are words truly lived by.